San Joaquin Regional Transit District (RTD) debuted the first of its six new articulated Express buses on Tuesday to serve increasing ridership along Route 40. The longer buses provide about 50 percent more space, a relief to riders who had to stand during Route 40’s busiest hours. RTD’s Manager of Service Development Nate Knodt said the change was a necessary response to increased use of the 40 Express route. The Stockton route runs from Hammer Lane to RTD’s Downtown Transit Center from 5:40 a.m. to 9:30 p.m. on weekdays. Riders were pleased upon hearing of the development. However, many Delta students questioned the effects of the bus articulation. Ashlee Liebig worried RTD will increase its fare rates as a result of the expenditure. According to RTD spokesman Paul Rapp, 88 percent of the articulation cost was funded by the Congestion and Mitigation Air Quality Improvement Program; the rest was paid for by funds collected through California’s Proposition 1B. Each bus extension costs approximately $1 million. However, Rapp said the buses’ operational costs remain low. Knodt agrees the decision to articulate was fiscally sound. “You’re probably getting more value in seat capacity than you are paying extra for the size of the bus,” said Knodt. 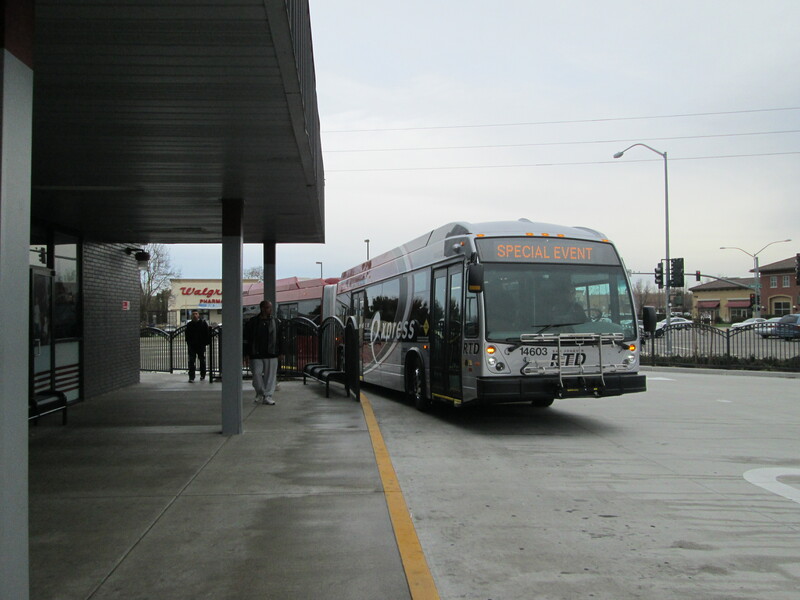 The first in-service articulated bus departure took place at 9 a.m. from the Hammer Triangle bus stop on Lower Sacramento Road. Seasoned passengers, local government representatives and members of the media snapped photos and snacked on free treats as they watched two long buses head south. The bus’s maiden voyage was accompanied by local media fanfare. Knodt said the new buses may someday serve other Express routes. Besides the longer buses, RTD will also increase Route 40’s weekend frequency “from every 30 minutes to every 20 minutes” between 10:30 a.m. to 6:30 p.m., according to a Feb. 11 news release. Delta student Alton Henry thinks the increased bus lengths will help students economically.